Clinton, Bachelet and Heredia in Gamarra. Photo: ANDINA/Juan Carlos Guzmán Negrini. 17:23 | Lima, Oct. 16 (ANDINA). 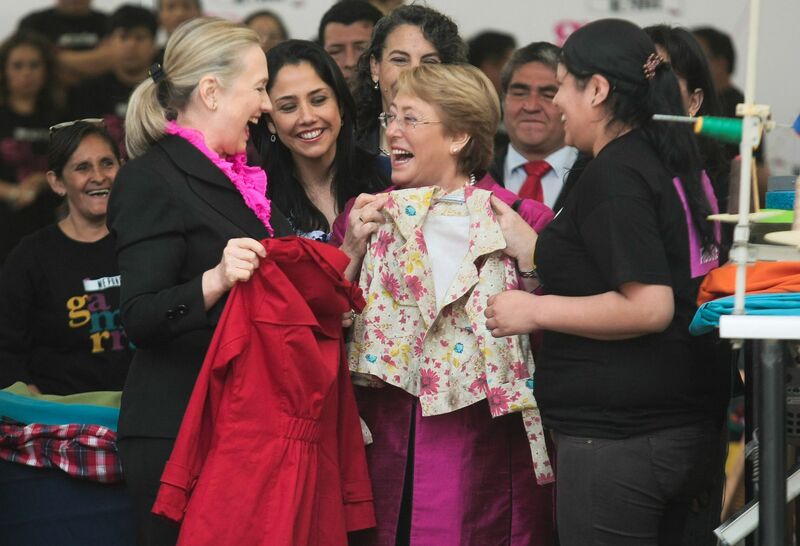 The U.S. Secretary of State Hillary Clinton showed a huge smile and was delighted with a garment made in the commercial emporium of Gamarra, located in the Lima district of La Victoria. The U.S. official received a red coat that a local merchant gave her and began to laugh with the surprise. The UN Women Senior Officer Michelle Bachelet and Peru’s First Lady Nadine Heredia accompanied Clinton on her visit to the huge cluster of garment factories and textile businesses in Peru’s capital. Both of them toured the emporium which reports sales of over two billion soles a year, receiving expressions of affection, greetings, and hugs. Finally, Clinton, Bachelet and Heredia took pictures with the merchants of the emerging trade center that has 20,817 companies engaged in the textile and garment.